The annual screen actors guild SAG awards are in full regalia right now. I’m not seeing too much representation when it comes to melanin, but what else is new. One thing for sure what we may lack in recognition will never diminish the commanding beauty of our sisters. I know Anthony Anderson agrees. Take a look. “Empire” star Taraji P. Henson, Brooke Mackie, and Ashunta Sherriff hosted the 3rd annual Halloball at the Sugar Factory in Chicago. This year, the theme of the event was all things ’80s. Spandex, Jherri Curls, and fanny packs were in abundance. Taraji donned a Grace Jonesesque outfit and her VIP section was a madhouse for the duration of the night. A few celebrity sightings included Yaya Dacosta of “Chicago P.D.” and Ta’Rhonda Jones of “Empire.” This year’s event stayed true to form with Chicago notables packing the Sugar Factory from wall to wall celebrating the official launch into the fall season. Check out a few of the pictures in the gallery below. LAURYN HILL SHOWED UP! The Powernomics tour featuring Lauryn Hill and Nas was launched in Chicago recently at Northerly Island outdoor concert venue. The cool late summer night brought out a sea of Gen X’ers excited to see two of the best lyricists hip hop has given the world. Scrolling social media the mention of the Nas show drew excitement; however the elimination of one obvious name did not go unnoticed. Lauryn has had her share of troubles. Tax issues, jail time and music industry woes have been a thorn in the side of the multi Grammy winning artist. Showing up late and sometimes not showing up at all for performances have affected fans to the point where it may feel like rolling dice to buy tickets to one of her shows. Having Nas as a co-headliner can’t hurt your chances of selling tickets and if Lauryn doesn’t show at least you got a Nas performance. That was something the fans didn’t have to worry about this time. After an amazing reggae filled opening set by Chronixx Nas hit the stage with an excitement that drove the fans bezerk. He did a few songs and disappeared off the stage then the backdrop started to fill up with emotionally jarring photos from across the world. One of the photos was of Miss Hill. The anticipation was high. The band played at a feverish pitch until the moment Lauryn came out and the crowd erupted. If you are expecting Ms Hill to perform any of her songs from “Miseducation of Lauryn Hill” you will get that, the only difference is that the songs will not sound like anything you have heard from the album. There is speculation that the songs are not performed with their original production because of legal issues. Instead Hill has opted for rapid fire production laced with African rhythms. The background singers and the band deliver amazing performances as Lauryn blazes the microphone mercilessly. My only suggestion to Ms. Hill is that she do the verse to “Many Mic’s” acapella. Nas returned to the stage to perform “The World is Yours” and “Hate Me Now” then Lauryn joined him to perform “If I Ruled The World”. Nas was engaged with the audience while Ms Hill found some issue with the sound while they sang. With that being said it was great to see these two legends perform some of the greatest songs ever written and it was even greater that Lauryn Hill showed up and showed out. Take a look at a few pics from the show below. WGCI’s Big Jam was LIT! WGCI’s Big Jam 2016 went off without a hitch at the United Center. After the drama that Trey Songz was involved with in Detroit he was able to make it to Chicago and perform for his fans. This Big Jam was pretty diverse as big jams go. The early part of the show was filled with Chicago acts who have gone national. G Herbo, LiL Bibby and Dreezy all represented their city properly and Chicago gave it up for their people. The controversial 18 year old LiL Yachty who says Biggie is overrated gave a decent set. He asked that the lights be turned down and performed his hit song “One Night” to the flicker of cell phone lights. Desiigner did as expected and took the level of energy up a tuck as he hopped frantically across the stage. The anticipation for Trey Songz was high once he sauntered onto the stage showered by the screams of his adoring fans he was able to give them what they came for. He stranded the audience and few times and got the attention he expected as his shirt came off. I have to say the highlight of the evening was watching Chris Brown bring a level of professionalism that is not see often in these type of shows. He really can’t be touched as a performer and you could tell he was holding back. I’m not sure who created the set list but having Young Thug close after Chris Brown was not a good idea. Young Thug came out unceremoniously after making the crowd wait about 10 minutes after his intro. You know Thug has his core fans so in their eyes he can Donna wrong. Overall his set was lazy and uninspired. It has to be hard to follow Chris Brown. Another Big Jam is in the books. We asked concert goer Jazmine Jackson what she thought of the show and who was her favorite. “This was my first concert and I had a lot more fun than I thought I would. I throughly enjoyed all of it, but mostly because my sister Jo and her friend had an amazing time. Personally my favorite part was Trey songz guitarist I was in love with his solos. I also enjoyed Chris Brown and Young Thug’s segments. The lil ratchet girl in me had a ball.” She said. Check out the pictures in the gallery below. Ginuwine showed up to the City Winery in Chicago to have an amazing set. He did just that. It’s been an interesting week for Ginuwine after certain pictures leaked on the internet and provided great entertainment for his throngs of fans. So, it was no surprise to see a packed house of Chicago’s most beautiful dressed in their night club best waiting to see Mr. “Pony” himself. Ginuwine did not shy away from the situation. He mentioned that he is not shy or ashamed. The only thing he had issue with is that he has daughters and he does not want them to remember him like that. All you heard after that was “YOUR DAUGHTERS NOT HERE! !” From the audience. It was a funny moment and added to the electricity of the evening. Ginuwine went through all of his hits over a 20 year span. The most notable moment was when he shared the challenges he was going through in his life. “My life has been going through a lot of turmoil. My father committed suicide, shot himself in the head. The next year my mom died from cancer, so needless to say I went through my time of turmoil tragedy, hurt and pain.You will never get over it, but you will be able to continue. But guess what, after 20 years I’m still here.” Right after sharing that he performed his song “My Whole Life has Changed”. He closed out the set with “Pony” and the City Winery was rocking when he decided go into the crowd. After 20 years Ginuwine has not missed a step. Check out a few pics below. 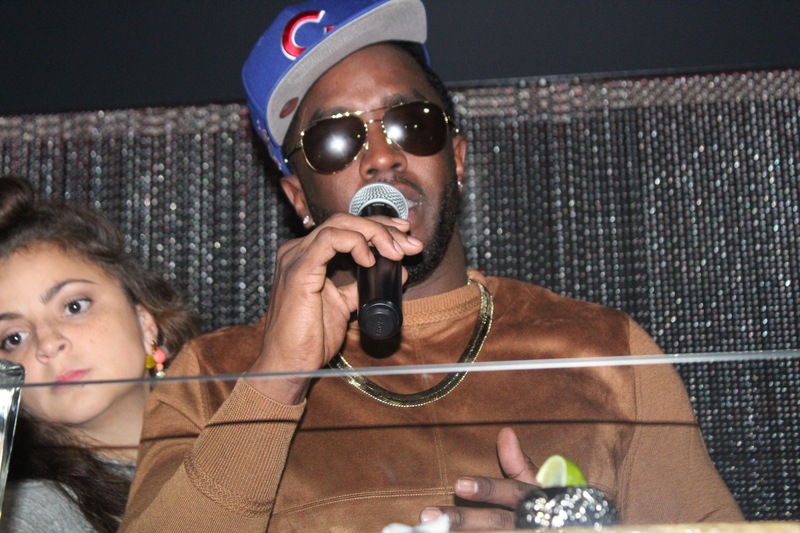 Music mogul, fashion designer and creator of spirits Sean “P Diddy” Combs was in Chicago recently promoting Deleon tequila. The top 100 influencers came out to Shay nightclub in the River North community to get their first taste of the upscale tequila. Shay was decked out in all things Deleon and the mixed drink of the night was called Chicago soul. This drink consisted of Deleon, some lemon juice a salted rim and a hit of Tabasco. Once Diddy entered the building people rushed to the VIP area to get a glimpse of the mogul. After fraternizing a bit Diddy made his way to the Dj booth. He gave a demonstration of how Deleon shots can be taken from the cap of the drink and spoke about how smooth it is. At one point someone handed him a Cubs hat and he placed it on his head to the crowd satisfaction. Take a look at a few pics below. GZA brought himself and the spirt of the Wu to City Winery in Chicago. When you think City Winery, a certain aesthetic comes to mind. The clanking of wine glasses, jazz horns and a sultry singer paints a traditional picture of what can be expected. These days, it’s a little different. As hip hop matures, tastes change and so does the expectation of what you will see. Fans soaked up every second, some reciting his rhymes. “It was a great show. GZA is my favorite rapper. My favorite part was when he did his acapellas. He is a great lyricist and he has great metaphors and has more substance than anyone else out there. I got my album signed too; that was the highlight of the night,” said Will K.
GZA did not just stick to his discography. He managed to sneak in a few verses from his Wu-Tang brethren. To see him run effortlessly through his rhymes speaks to the bond that the Wu has and the impact they have made over the past two decades. Taraji P Henson, Brooke Mackie and Ashunta Sheriff were all present and in full Halloween regalia at the second annual Hallo-Ball. The event was held at Room Seven on Chicago’s Gold Coast. To say it was the party of the night is an understatement. Taraji was rocking a beautiful Egyptian Queen costume while her co-star Bryshere Grey wore his Rick James wear. The VIP area was packed to capacity, drinks flowed people danced and embodied the characters they chose to dress as. One of the most original costumes was Che “Rhymefest” Smith as Black Panther. Jeezy was also in the building celebrating the release of his latest album Trap or Die 3. As Monday nights go this was one for the history book. Check out a few pics below. The cast of the VH1 show Black Ink Chicago were on a high celebrating their second season. The Old Crow Smokehouse in the River North neighborhood of Chicago was packed with cast member and supporters’ alike ready to celebrate one of the most popular reality shows on the VH1 network. Fans lined up outside the venue to get a glimpse of their favorite cast member. Once everyone made their way inside the party started. The red carpet was the center of attention for a while but one the show started eyes were glued on the many TV screen posted around the establishment. The second season started off as a recap of the last season that ended with stories of infidelity, new loves and new business ventures. Ryan the owner of 9mag finds himself hiring new artists for the shop because, Phor is focused on his rap career, Van is in boot camp, Kat has launched her burgeoning career as an artist in to the possibility of starting her own shop, Don is having paternity issues and Charmaine is being her usual energetic self. Chicago rapper King Louie visits 9Mag after being shot in the head and surviving. He comes to get a tattoo from Kat who he considers his guardian angel because of the Owl tattoo by his head that he says protected him during the violent encounter. When speaking with Ryan he asks for Kat and this is when Ryan discovers that Kat has set up shop in an upstairs unit that is not 9Mag. This is a cause for some tension. All of this drama and tension was not witnessed on the night of the premier as cast members lined the red carpet taking pictures and laughing with each other. It was a night of celebration and an opportunity to watch these highly successful mellinials deal with real life problems.